Simply put the highlighted statements in the quotes above are incorrect, unless we apply a very broad interpretation of “Yoruba ancestry”. Reading instead ancestry from the entire Lower Guinea region (area inbetween Liberia & Cameroon), as was most likely also the original intention of the authors. In their paper they start out with saying that they aim for a “finer characterization” of African origins by not following previous studies which used “single populations as ‘consensus’ continental sources (for example, Yoruba from Nigeria for the whole of Africa)“. It is therefore regrettable that they maintained the usage of a “Yoruba” label to identify an ancestral cluster which goes far beyond any proper Yoruba ancestry in a strict sense. Especially since readers of newspapers will tend to take these terms literally! Just to quickly illustrate the extent of “true” Yoruba ancestry across the Americas this table below should be useful. It is apparent that really only Brazil, Haiti and Cuba received a great number of Yoruba captives. (post slavery migrations of socalled Yoruba Recaptives to the Anglo Caribbean are not included). Below chart taken from the Slave Voyages Database also makes abundantly clear that even when using a looser interpretation the Bight of Benin, where Yorubaland is situated, did not provide the greatest number of slaves to any (broadly defined) destination within the Americas, it is rather West Central Africa which stands out in this way. In the supplement of this study (see this link, page 7) a full overview of all the sample groups can be found. The African samples seem to be pretty much the same ones as used in the previously reviewed studies specifying the African American genome (Zakharia et al., 2009 & Bryc et al., 2009). Only the Herero from Namibia appear to be a new addition. I guess this highlights the pressing need for new African sampling when after six years it still boils down to these two same old proxies of Mandenka and Yoruba samples to capture West African diversity. Even more amazing then that still a true cluster galore is being created out of this limited dataset, but only involving the least relevant samplegroups from southern and eastern Africa. None of which are historically known to have been involved (in noticeable number) in the Trans Atlantic Slave Trade…Some of these ancestral clusters being based on only 1 individual sample! (see supplement, page 8). Implying great heterogeneity amongst these samples. It seems to make the whole analysis (pertaining to African specification) less robust to be frank. When it comes to the sample groups from the Americas, by far the largest in number is the one called “African Americans B”, 2023 individuals being utilized. All the other samplegroups are much smaller in number, in between 19-75 after quality control. No further details are given so possibly there might be some regional bias whereby only a specific part of the country is represented. It is useful to compare the outcomes of the African American group B from this study with the previously discussed studies (Specifying the African origins of the African American Genome. Actually only the Mandenka and Yoruba based clusters seem directly equivalent but grouping all the remaining 30 (sic!) other African clusters together you might get an approximate cluster for “Bantu” ancestry i suppose (more details in next section). The original data can be obtained from this supplementary excel file. Despite the seemingly much increased granularity of 33 African clusters the results are actually not that drastically different from the 2009 studies. Especially Zakaria (2009) seems to come close, it’s just that for some reason this present study seems to undervalue “Mandenka” ancestry, especially compared with Tishkoff (2009). Based on historical sources you would expect a much larger Upper Guinean contribution than just 7% or 5%, so i’m pretty sure this ancestry could actually be hiding under the socalled “Yoruba” umbrella category. Once more demonstrating the misleading character of the labelling. So that’s why i decided to do my own calculations based on the original data. I made one group for all of the 30 Eastern/Southern African clusters as i believe it to be more informative, plus i also renamed the Mandenka and Yoruba clusters. The result (sorted for “Upper Guinea”/”Mandenka”) can be seen below. Via this online spreadsheet you can check the calculations. We can verify that Hispanic Americans seem to have a greater share of Upper Guinean ancestry indeed. Note should be made however that especially the Mexican and Peruvian samples show very low levels of total African. Then again these minor or even trace amounts of African ancestry could also imply that they were mostly inherited from the earliest colonization period. Therefore being perfect testimony of the ethnic composition of Africans at that time. Another very interesting finding is how Barbados is overwelmingly shown to be the most “Lower Guinean” (as measured by the “Yoruba” cluster). This is actually also confirming slave trade records which clearly show the area in between the Gold Coast and the Bight of Biafra to have been even more important for Barbados (and most other parts of the Anglo Caribbean) than for African Americans who had relatively increased contributions from both Upper Guinea and Central Africa (but with Lower Guinea still being predominant as well). p.s. 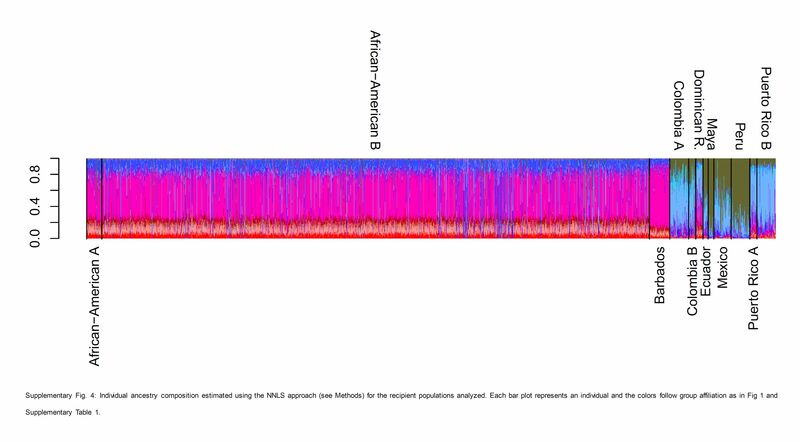 The average total African ancestry given for the African American samplegroup B might not be very representative. If you enlarge the bar below you will notice many individual lines who seem to have little red-pink colouring (African clusters) but instead are blue-purple (European clusters) almost all the way. Indicative of sampling errors probably. This entry was posted in African Americans, Anglo Caribbean, DNA Studies, Hispanic Americans, Upper Guinea, Yoruba. Bookmark the permalink.